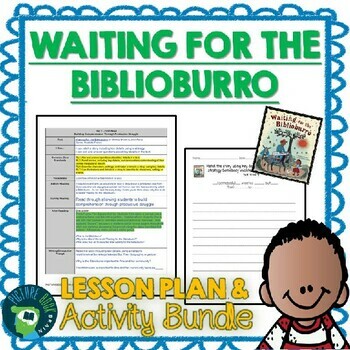 ✏ This is a guided reading or interactive read aloud lesson plan for the realistic fiction mentor text book Waiting for the Biblioburro by Monica Brown and John Parra. The plans include a teacher script with strategic stopping points and questions for students. 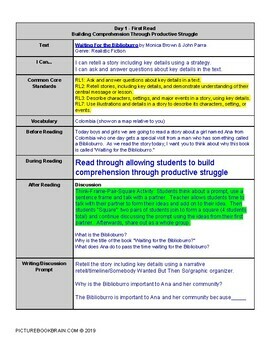 It also includes prompts for student responses through discussion or in writing or reading response logs. This lesson plan is also well-suited for dual language / dual immersion bilingual Spanish classrooms as this book is also available in Spanish titled Esperando el Biblioburro. The printable prompts are in English and also in Spanish. 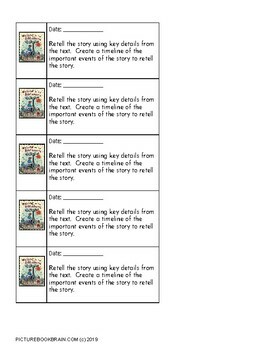 This lesson is focused on a theme of summarizing key events (4 strategies: narrative retell, Somebody Wanted But Then So, timeline, and graphic organizer), close reading for character feelings, analyzing character traits, comparing and contrasting, main idea and details, integrating knowledge from multiple sources and author's message / lesson but can easily be modified for other uses. 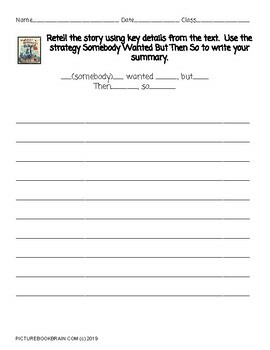 Great for community studies and writing!